As I write this at the airport on my way home from New York Fashion Week, I've never been more excited to start wearing the colour red. 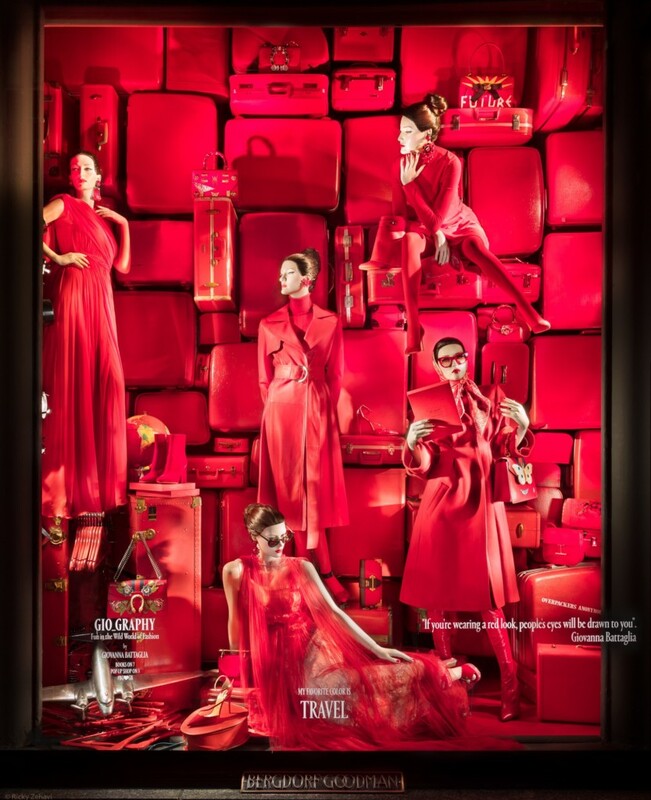 Walking along fifth avenue, I came across the Bergdorf Goodman's window display and one window was completely dedicated to the colour red. Red monochromatic ensembles appear to be one of the biggest trends of the upcoming fall season and red accessories are a must. I couldn't wait to start styling the new Coach x Selena Gomez bag which paired perfectly with my go-to denim and blazer look. I plan to try some bold looks with the colour red for upcoming Vancouver Fashion Week and I have a few NYFW looks to share that incorporated pops of red in the upcoming weeks, so be sure to stay tuned! How do you plan to wear red for Fall? Using red in outfits is perfect for fall. I just love that bag, coach just has the cutest purses. Qué guapa estás me ha encantado tú look, y el bolso es precioso. Love that bag! It’s so classy & sophisticated in such a bright shade of red! Your Coach bag is stunning! I love the pop of red in your outfit!! Love the entire look babe ! You look amazing, Thanks for the inspiration! Red is my fav color and your bag is absolutely glam! You look superbly gorgeous. Stunning outfit. Love the details. That bag is stunning and looks very versatile. Yass! I love the Coach bag for an added pop of color! Torebka jest świetna. Taką bym chciała w bordo. Mam botki z primeboots i poszukuję takiej torebki! 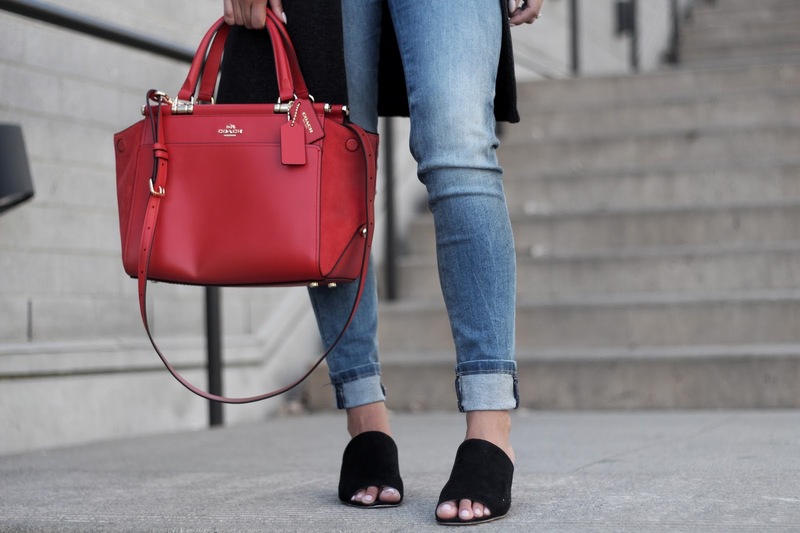 Your red bag for fall is really a great choice. Very stylish and trendy. I love this look, so classy and chic! Cute bag too! I love the entire outfit and the pop of red is just perfect! Love Coach bags! The pop of red is one of my favorite things! I love this bag too and the all red window display is beautiful! You are looking stylish and the bag is fabulous. Love that color! It is a gorgeous bag! SO IN LOVE with that bag! I think I need to start wearing more red as well! It's definitely a color that I don't have enough of in the closet right now. Thanks for the inspiration! I have been loving red lately too! Gorgeous bag. That was me at BR in NYC. You should have said hi! Stunning bag! I love this look! I can't wait to hear all about your nyfw experience. I love that red is so in right now because it's such a showstopping color to wear and experiment with. I love your bag. This collab is the best ever! Love SG! Love how the red bag just pops out of the photo. Really gorgeous outfit as well. 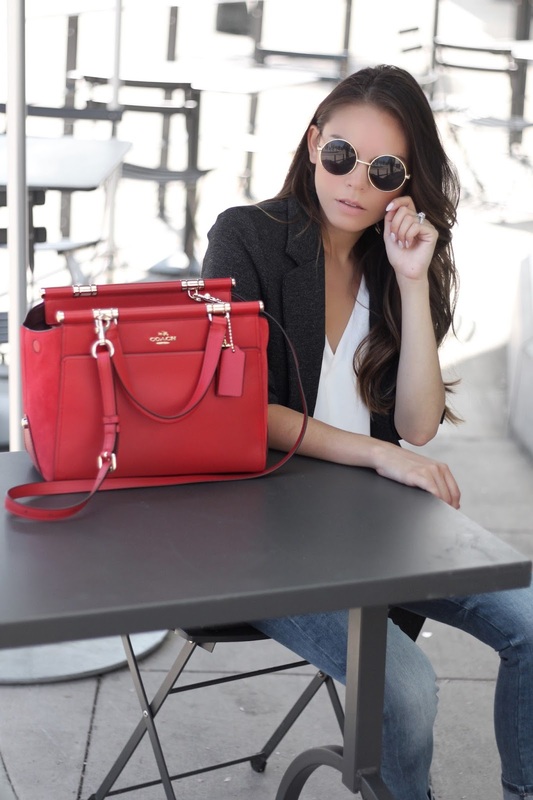 Love the red bag - it looks so chic against any outfit!